Suggested Fitting: Women order same as street. Men order 2 sizes larger. For my son's shoes, he wears 8.5 mens. After reading the reviews, I went up 3 sizes and changed to wide to adjust for women's sizing and the fact that they run small. So for 8.5 men's street shoe size, I ordered 11.5W for him, and it fit perfectly. These run ridiculously small. My 10 y/o daughter wears a size 4.5 street shoe so I followed the instructions and added 2 to get her women's street size of 6.5. Then it says to order same size as women's street size so I ordered the 6.5 and they are the exact same size as her children's 5.5 Bloch jazz shoe that has been getting tight for a year! There is no way these are equivalent to a women's 6.5 street shoe! Will obviously be returning them. Haven't decided if it's worth the hassle of ordering a 7.5 or 8 and taking a chance that they might not fit either. May just purchase at local dance store. My daughter wears a street size 8 and usually a 9 with various dance shoes. We had to order a 10 so just be aware they really do run very small. Fit is fine otherwise. I haven't danced in them yet so we'll see how well they hold up. They're pretty comfortable and grip well, I just suggest getting a size up. I wear an 8 street size and the 8.5 was too small, had to go with the 9. But once I got it, fits well. What is wrong with the sizing? My son wears 10.5 men's. I order 12 wide for him. No way are the shoes that were delivered a size 12! Frustrating. I wish it wasn't so hard to find the right size for my son. My 9 year-old wears a 2.5 street shoe, so I ordered a 4.5 and a 5 as per recommendations to order 2 sizes bigger than her street shoe size. They were WAY TOO SMALL. I will be trying a size 7 and 8 next time to see if that fits better. Plan on at least 1/2 size larger than street shoes. I was doing a very dance-heavy show with rehearsals everyday for 5 hours and these were very comfortable. They started falling apart a little bit after the show was over and I got these 2 weeks before the show ended. I love these. They look amazing when I point my feet and look nice when i'm dancing. No complaints from me. I ordered these shoes for my daughter in a size 9M and she wears a 8.5 in street shoes.and was very disappointed. I recommend ordering 2 sizes up. The shoe was too snug and too short. Both my daughters have worn this exact brand since they were 5 years old and started jazz class. They run very small. I always have to order a full 2 sizes larger than their street shoe size. But they are great. They last until my older daughter outgrows them and then the younger girl wears them until she also outgrows them and then they are still good enough to donate to Goodwill. They both dance 3 to 4 days a week year round. They are super comfortable. I have no complaints and would highly recommend them. My daughter had other jazz Capezio shoes (different model) in size 9.5 and they were too big. I ordered these Capezio shoes in size 9 (which is her street size) and they are too small. I am very pleased with the shoes. They run a little small. Or it could be they need to be broken in. I normally get a size 9 in my dance shoes; however, these were a little snug. They weren't uncomfortably snug, but I noticed a difference compared to my other shoes. I would recommend going up 1/2 a size. The shoes are very durable, the quality is nice. They were also very affordable. They were delivered in an expeditious manner. Overall, I'm pleased with my order. We order these everytime she grows out of her current pair. Love the price too. These shoes hold up through it all! I purchased these for my son who is in musical theater. He is a size 12 street shoe, so I ordered a 14 as recommended by a dance instructor. They seemed snug at first, but after wearing them for a while, were fine. Being leather, they stretch. They sure looked small at first, though! My son hasn't actually danced in them, yet, but hopefully they will be fine for the stage. So happy with the shoes in a 12.5. They are so hard to find. Shipping was very quick. I bought these back in September 2014 because I was taking a dance class at school and needed a new pair. These pair have always been my favorite, the only problem is that they wear out fast. I recently purchased Capezio E Series Jazz Shoes for my daughter in both the Carmel & Black Colors. This shoe is comfortable and reasonably priced. I have not had to buy a new pair in at least 2 years. The durability is amazing! I highly recommend these shoes to any dancer. I will not hesitate to purchase this style again when needed. The price is right and they last as long as the dancer takes care of the shoes. Every pair of size 4 dance shoes fit my daughter except these Capezio Jazz shoes. Frightfully since they are extremely small you cant set them aside for your dancer to grow into. You have to pay to return, plus get -0- reimbursement for original shipping cost and have to pay additional shipping for replacement pair. After I realized the negative financial impact I clicked on reviews and saw repeated reports of product running to small. Raising further concern that discount dance supply doesn't take the feedback to place an alert on the product giving the customer opportunity to read and adjust size before checking out. The shoes fit nice and give the foot a nice flexible fit!!! These are the only jazz shoes that I will EVER wear! They are EXTREMELY durable! (Mine lasted me a year and a half!) and very comfortable! They are GREAT for turns! The only down side is that they run extremely small, but just order a couple sizes up! No big deal! I refuse to buy any other jazz shoe but these! These shoes are very high quality and are very durable. They also look great on and make my feet look so much better! However, they are not the easiest to turn in. They stick to the floor too much because they have too much grip on the bottom of them. I always where them for performances because they look great, but i wear different ones for class. Two whole sizes TOO SMALL. My daughter's normal shoe size is a woman's size 7. I saw the reviews said they were small, so we ordered an 8. She can get her foot in there, but it's super tight. We have to pay the darn reshipping fee and will be ordering a size 9:( Aside from this, these are great shoes. Product was fine. Color, feel and look as expected. I did have to return the shoes because they were too small even though I ordered larger than street size. Ended up having to go into another store and pay more. These are my daughter's favorite jazz shoe. Comfortable and durable. Looks good on her feet. She swears she turns best in this style. I ordered the dance shoe by selecting 2 street sizes larger than my 7 year old daughter currently wears. The size 5 shoe that I ordered was unbelievably small. I ended up ordering a size 6.5 and those work well. Don't be afraid to order these larger, you will need to do so. Fits snug and runs small due to the neoprene insert. Looks great on and feels comfortable and form fitting. These were purchased for my daughter who is 12 years old. If your are looking into buying a jazz shoe,this is the one to buy! They fit perfect! I have had mine for 1 1/2 years and the still fit! My feet are growing like crazy and he shoes grow with me because of the elastic! order the same shoes as previous, but 1/2 size larger. Shoe looks and measures shorter and doesn't fit. Now I have to pay to send back. I think this pair was missed labeled. Bought my daughter these in black and caramel, and they are comfortable and have a nice shape, and they'll last you a while. Like most things I've gotten from Capezio, I find them very reliable. 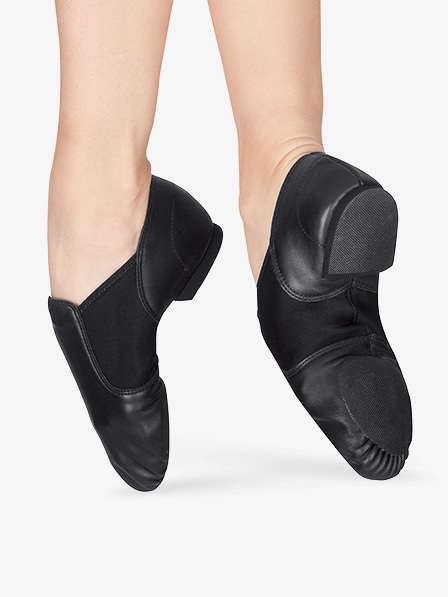 I have these in black and caramel, I've been using them for awhile and like most things I've gotten from Capezio, I find them very reliable. They do run a little bit small. I have huge feet, but my main problem is that I'm never really sure whether my street size is 9 or 10; it just depends on the shoe. I'm a 10 1/2 in these shoes, so I'd say go at least a half size up. If you want a softer leather and more form-fitting shoe, you'll probably have to upgrade to something more expensive, but these really are good for the price. They are quite comfortable and have a nice shape (even with my giant feet), and they'll last you a while. I do find that they're hard to turn in when new - usually I break them in a little by rubbing the soles together to wear them down a little, just to get rid of that extra friction. Before buying my shoes, I read all the reviews and I understood that they run small, so I order 1 size 1/2 bigger. It was a big mistake, the shoes were really too big for me. So I sent them back and reorder my real size in wide (street shoe 6 1/2). I was worried because my recital was coming soon and I didn't have my caramel shoes to dance but I got them on time et the size was right for me this time. I think those shoes run probably very small for kids but not for adults. I will recommend to order them in wide because they tend to be very narrow. Normally, I fit a medium but with Capezio I have to take a wide to be confortable. I love those shoes! These were the first jazz shoe I ever bought and I've been incredibly satisfied with it so far. I love that they are slip on as opposed to a tie on shoe and the neoprene on the arch is super soft and comfortable. I take class five times a week (hour long classes) and I've never felt any discomfort with this shoe. I saw some reviews that the shoe doesn't allow your foot to breathe much, but I never had this problem (perhaps if you are taking longer classes, this could be an issue). The only minor issues I have had with this shoe is that the leather tends to stretch out after a few wears, so i would recommend ordering a half size down. It may feel uncomfortable at first, but they will stretch out to your true size. I'm constantly readjusting my shoe on my foot in class because they have stretched out to be a half size too big. And while the shoe is great/secure for turning on a wood floor, they tend to be more difficult/stick when trying to turn on marley (I switched to a suede bottom shoe for those classes so I would take that into consideration as well). But other than that, I have absolutely loved this shoe. Over a year later, they are just beginning to show signs of wear. I am surprised how long this shoe has stayed intact (the sole on the bottom of my main turning foot is just beginning to wear off). 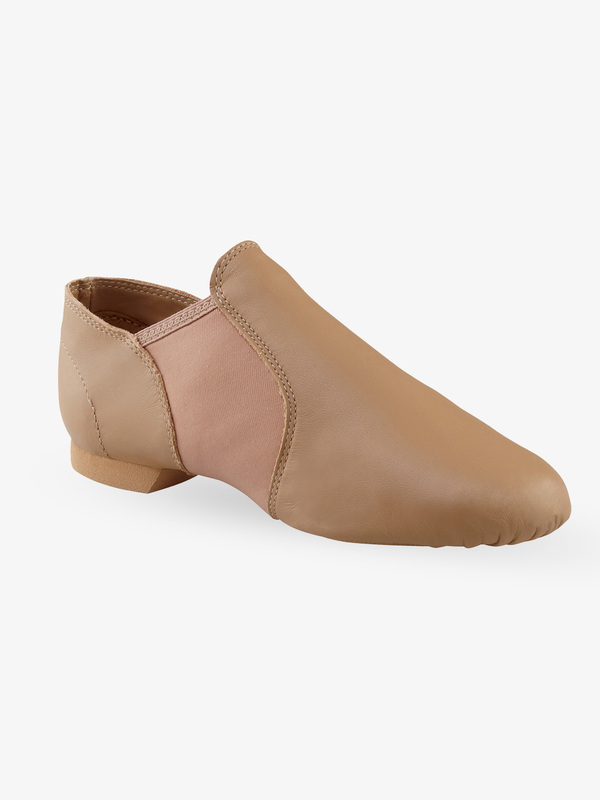 For a beginner dancer, this is a really great, reliable starter shoe! These are super comfortable! I wear anything from a 9 to a 10 and the 9 worked for me here. Only problem was that they were a little sticky when doing turns but then again that could just be the studio floor or something. Bought these almost a year ago and they still have not broken in. The sole is very sticky making it extremely difficult to turn in. I would not recommend these shoes. I read the reviews and thought these shoes would run small but I find they fit just fine. I'm glad I didn't order a bigger size, they would be way too big. My old jazz shoes stretched out nearly two sizes by the time I needed a new pair and I would guess that these will too. I have only used them once but they are flexible and durable. The padding inside of the shoes make for extreme comfort. we made sure to read the reviews t hat suggested to go larger then the street shoe and the size we selected was perfect. great price and comfort. shipping was quick and easy. I bought these shoes for my teenage son. He wears a size 12, so I decided to get him size 14 Wide because he has a very wide foot. This was perfect for him and I was delighted. We only started using the shoes so I don't know about the durability but they are comfortable. I ordered a couple sizes of this shoes because it was not carried at my local DDS. I tried sizing up and ordering diff widths, seriously this shoe was determined to not fit me. BAD if you have a high, strong arch, high instep, wide metatarsal and narrow heel. Really a poor choice for a diamond foot shape. These are hard shoes to fit, I would not order them without trying on first. It might work for a long narrow foot. I absolutly love these jazz shoes! They feel great and they look nice on stage! My only complaint is that over time the jazz shoes streach out so you have to buy a new pair every once in a while. Also they are hard to turn in. They are great shoes but if you have to do a lot of turning in your dance then I would buy a different pair of canvas jazz shoes. I LOOOOOVE these shoes! I bought them last season at a local dance store, so I can't say about the sizing. The leather is really nice and the gel arch is so comfortable! Still no holes and I use them for everyday classes! They make your pointe look nice and arched. I totally reccomend these. I just got these for my daughter for her birthday. I noticed the reviews mention that these run small, so I got her a size 1 & 1/2 sizes larger than she wears..... yet when we got them, they are SO small that she can't even get her foot in them - wow! We are actually going to have to get a good 3-4 sizes larger than what she wears... which seems excessive to me. Received the shoes with in two days of ordering they were exactly what we wanted....and affordable! 20.00 cheaper than in the store! I ordered both the tan and black in the shoe. I wear a 6 in street shoes, but I always get a 5.5 in jazz shoes as I like them to fit snug - and my feet are no longer growing. The 5.5 fit great - and they do stretch a lot. I also have a wider foot so I ordered the wide in this shoe and I am very happy with them. The only thing is I found the tan to be a bit narrower and used a little more stretching, but both pairs fit great. They are very grippy and great for spinning! Used them for the first time for an intense dance camp - very comfy, no working in needed. These do look like great jazz shoes but I was astounded at how very small and narrow they run. Granted, they will stretch some but I doubt it will be enough for even my small feet. I sized up from my normal 3.5 to a 4 and still too tight. I was unsure what size to try again, so I sent them back and will not re-order. They are nicely durable shoes with good bottoms for comfortable movement. WARNING ORDER A 1 - 1 1/2 SIZE UP THEY'RE SUPER TINY I had to exchange mine b/c of it They're cute They take a little getting used to b/c they feel weird w/ the middle being stretchy excited to use them, they look like baby shoes hehe! remember they're not supposed to be big, they're supposed to be snug and fit perfectly. Make sure your toes are comfy! theses were amazing. i wear size 8 and a half but when i got these they were a little bit small . i don't know if its because they are new and haven't formed to my feet yet or what but they were a little bit small other than that i think they are great and amazing .i mean my dance coach recommended them for me so i guess they are pretty good because she has been dancing for years and years . The reviews complaining about this shoe running small had me concerned. I ordered the black in a half size larger than my street shoes, and they fit fine! these shoes are comfortable and look great. but instead of doing 2 turns in them i can only do 1 or 1 1/2. and the little rubber heels on them sometimes hurt my feet. Ordered two pairs of same shoe, same size, different colors. The black shoes are an inch and one half shorter in length and a bit wider than the tan shoe. Tan shoes fit great, true to street shoe size. I did place orders at different times, but seriously, should there be that much variation in sizing? By the time I return and re order, I will have paid more in shipping than in shoes. I have seen many types of jazz shoes, but these are my absolute favorite. For jazz shoes, I think these are the most visually appealing and stylish, and they fit great. They do fit tight...consider them leather socks, and of course if you wear them on concrete they will tear. But for everyday dance use, they are perfect! We have marley dance floors at my studio and these are very hard to turn in. I ordered these for my daughter who wears a womens size 7 in street shoe. I ordered an 8.5 to be safe as I've seen other reviews recommend going up a size to a size and a half larger. The 8.5 are still too small and I would probably need to order her a 9.5. The shoe is nice looking but the sizing is horrible. I will be returning these and not ordering another pair. These shoes run super small! I am very fortunate to have tried them on in the store because I had to go up a size and a half! With that said, I recommend ordering one size up. But other than that, they're very comfortable and durable and look great! Most Comfy Dance Shoe Ever! Love this shoe. I always have worn Bloch and my dance studio wanted us all to wear the same shoe an ordered the Capezio EJ2 now that is all I want to wear and they are way cheaper. I love these shoes. I have them in both the caramel and the black, and I use both for performances and practices. The lower profile really accentuates the arch and makes your feet look really good. Plus they have small cushions on the ball and heel so you feel like you're dancing on a cloud. They are really comfortable. The one thing that put me off a little was that the black ones dyed my tights with black lines, but it washed out with a little Spray and Wash and rinsing. They're great shoes, though! So much easier to deal with than laces, and its easy to roll over the top of the foot because it's a slip-on. How to size for boys/ My son wears a boy's size 7. Thanks. Hello! Thank you for contacting us. We recommend to order these shoes in the size 9. What is the size comparison to a Men's street shoe? I am buying these for my son who is a size 10 street but we got size 11 Bloch jazz shoes and they are tight. Any idea how to convert for these Capezio's? These shoes are actually sized for women, and they do run on the small side. To get the men's equivalent I would order up 2 sizes from his street shoe, making it a 12.0. Since they are a little snug I may even order up another .5 size to a 12.5. Unfortunately though we cannot guarantee sizing, but based on experience that is my best recommendation. Do these run small? My daughter wears a street shoe siz 6 1/2. What size should she get? The manufacturer recommends ordering same as street shoe size. However, I do see a lot of customers that need to order up a size. These shoes do start a little smaller and stretch over time. I might recommend going up a size, though unfortunately I cannot guarantee it. How do I know my daughter's shoe size? The sizing on this item states to order the same as street shoe size, which would be what she normally wears in a tennis shoe.